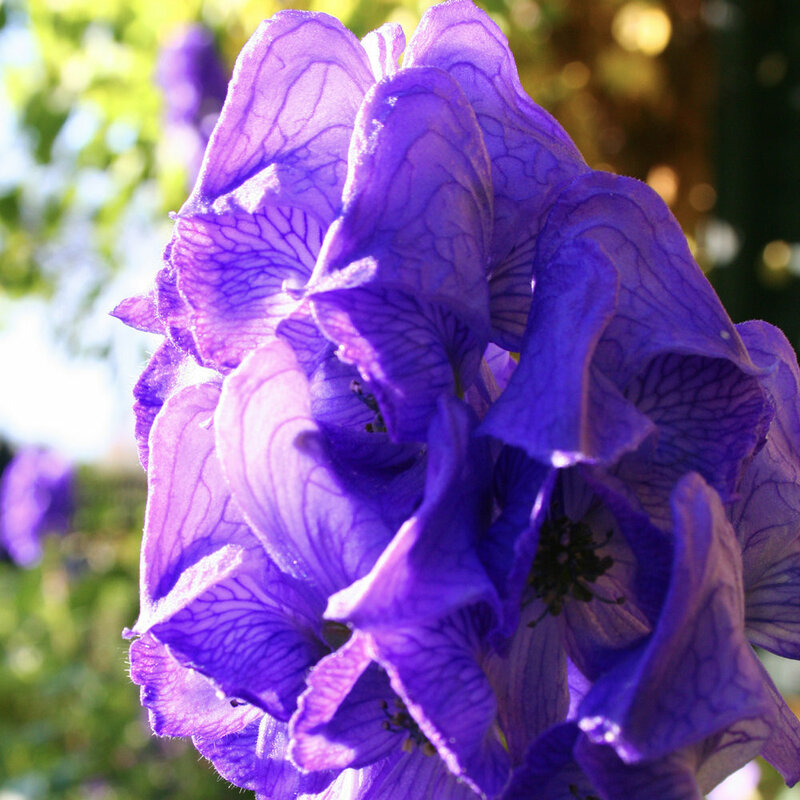 Monkshood is the stoic reliable "good family plant" in my garden. It stays put, it returns each year without fuss and quietly replenishes its kind. The blue hood clusters are the binding colour between good shocking pink companions Aster novae-angliae 'Andenken an Alma Pötschke' and other colour-friendly autumn plants. And here I mean the unwieldy purple- blues mainly of the novi-belgii asters. With their azure blue, they pair delicately with Japanese anemones in pale pinks or whites. For the gardener wishing to (at least in part) to garden on automatic pilot, these are the blues we need. In autumn’s floral choir they are singers for the back row (grow to 100 cm). In late August the knuckled buds are formed and preparing to launch these „blue-veined“ beauties. By October the stems are weighted with the clumps of hooded flowers that will hold the display until winter frost takes grip. Genus Aconitum stems from the Latin akoniton refering to the poisonous nature of this plant (herb). Specific epithet honors medical doctor and plant collector in China Dr. J.R. Carmichael (1863 - 1877). 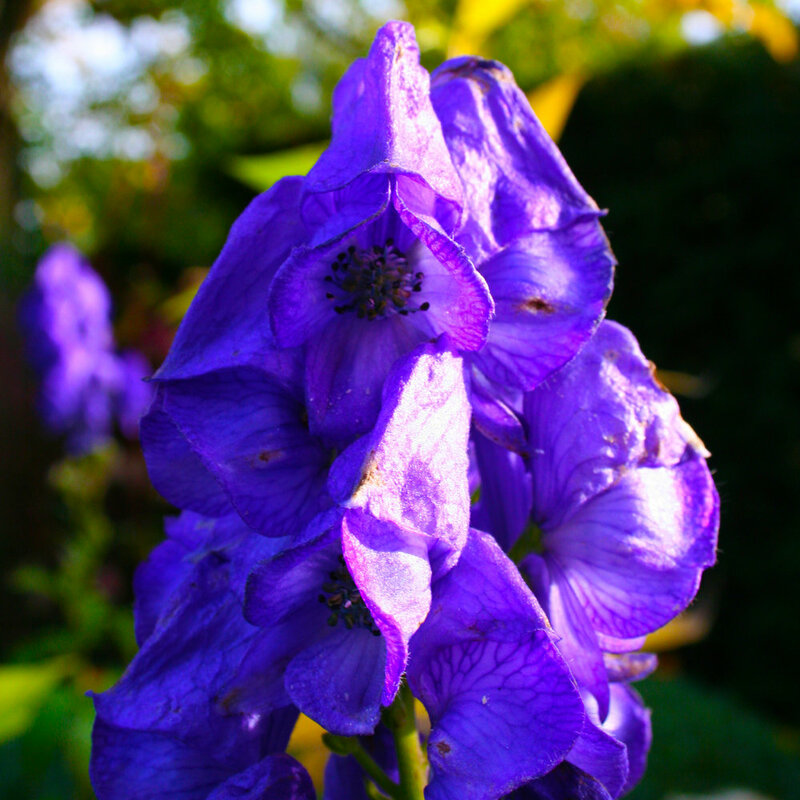 'Arendsii' (the variety) is as is custom in plant nomenclature, named after Georg Arends (1863-1952) a German nurseryman who first bred this variety of monkshood (approx. 1945). Arend’s nursery is one oft he oldest in Germany in Maubach in Wuppertal-Ronsdorf near Cologne. Arends in his time bred over 350 new hybrids and built up a significant collection of nature photos (glass plate).